Oswin Woodward has severed his connection with the Gorham Mfg. Co., Providence, and accepted a position with Straker & Freeman, of this town. E. Gordon McLean, who has been with Ryrie Bros., Toronto, for some years, has severed his connection with that firm and taken a position with the Gorham Mfg. Co., Montreal. He will represent them on the road between Toronto and the Pacific Coast. Francis J. Curley, for 19 years' employed in the designing department of the Gorham Mfg. Co., has started in business as modeller and designer at 776 Park Ave., Auburn. Arthur. W. Barrus, with the Gorham Co., was re-elected for the ninth time State Council Secretary of the State Council of Rhode Island of the Junior Order of United American Mechanics on Tuesday last. Edward Holbrook, manager of the Gorham Manufacturing Company, has been elected a member of the New York Chamber of Commerce. In the Jefferson Market Police Court, Saturday, Jos. Nelson, 30 years old, was charged with stealing a case of silver ressolvent from the Gorham Mfg. Co., by whom he was employed. The Gorham Mfg. Co. had been missing amounts of the valuable powder and reported the matter to Police Headquarters. Detectives who were detailed on the case saw Nelson leave the company's factory, Friday night, with a large wooden box. They decided to arrest him and, on doing so. 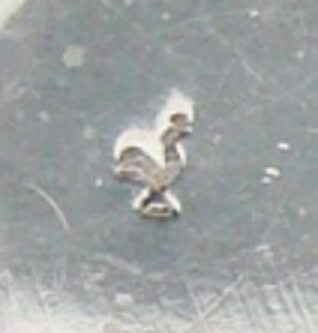 discovered that the box contained resolvent valued at $300. Magistrate Poole held the prisoner to await the action of the Grand Jury in $1,000 bail. At a meeting of the Goldsmiths' and Silversmith's Free Trade Association, held at 12, Pall Mall East, on the 2nd inst., the chairman, Mr. Edwd. J. Watherston, said that although it was scarcely probable that the Government would be able to deal with the question of hall-marking in the next session of Parliament, owing to arrears of public business, it was his firm belief that next year would see the last of the impolitic taxation on gold and silver plate. Nothing could be more unreasonable, in the face of the depreciation in the price of silver, and the fall in the value of the Indian rupee, than to tax the raw material, thus limiting its consumption for manufacturing purposes. 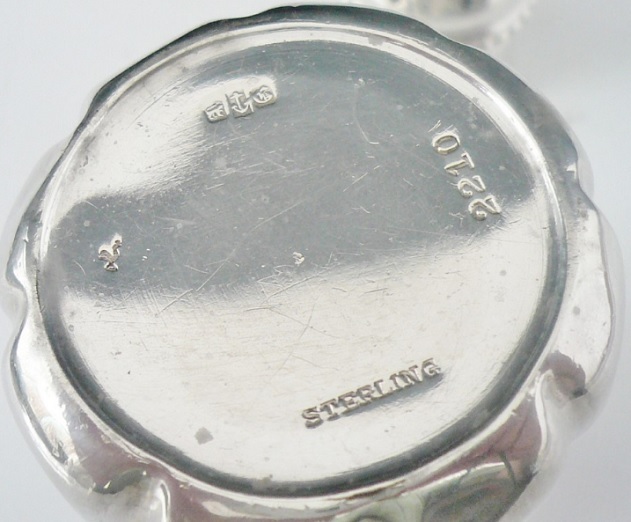 The tax upon silver plate was always a most impolitic tax, but it was ten-fold more impolitic when silver had become a drug in the market, and when skilled silversmiths were being forced to emigrate by reason of the limited trade in this country. Mr. Gorham Thurber, of the great American silver-smith's firm, of Providence, Rhode Island, had lately been over, and had secured thirty of the best workmen in England. The fact was that the silver trade in this country had been taxed almost out of existence. 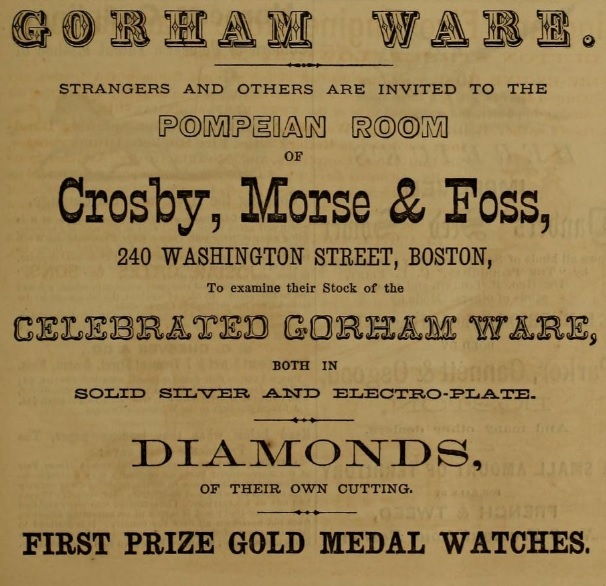 Announcement is made that the Boston office of the Gorham Co. is in the Crosby building, Washington St. E. H. Kipp, formerly in the office, has been given a position as traveling salesman for the New England territory. The Gorham Manufacturing Company, whose preferred stock is so tightly held by fortunate owners now, made a clear profit of more than $630,000 in the past year, according to reports in financial circles, and is earning even better than that this year. An extensive addition is being made to the brick building containing the woodworking and case departments at the Elmwood works of the Gorham Mfg. Co., this city. Another is being erected on the building, the dimensions being about 50x100 feet, bringing the roof up to the same height as that of the main building at the works. Edward Holbrook; vice-president, John S. Holbrook; secretary and assistant treasurer, John F. P. Lawton, assistant secretary. Wm. E. Keyes; superintendent, Fred C. Lawton. The following directors were elected: Edward Holbrook, Herbert J. Wells, John S. Holbrook, John F. P. Lawton, E. Frank Aldrich, Russell Grinnell, Fred C. Lawton, Henry S. Sprague and Frank W. Matteson. 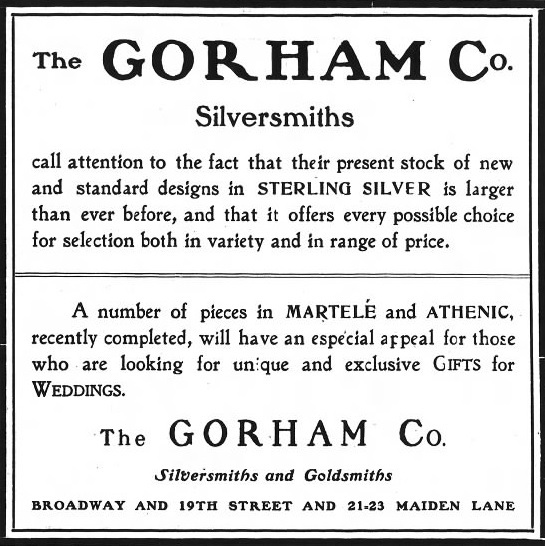 The Gorham Mfg. Co. recently completed the silver service for the battleship Rhode Island. It is to be the gift of the people of the State, the amount for its purchase having been raised by popular subscription. The cost was $8,500, and the largest single piece is a punch bowl which holds five gallons. It stands 15½ inches in height, and is two feet in diameter. The set contains a number of pieces of elaborate design and exquisite workmanship. 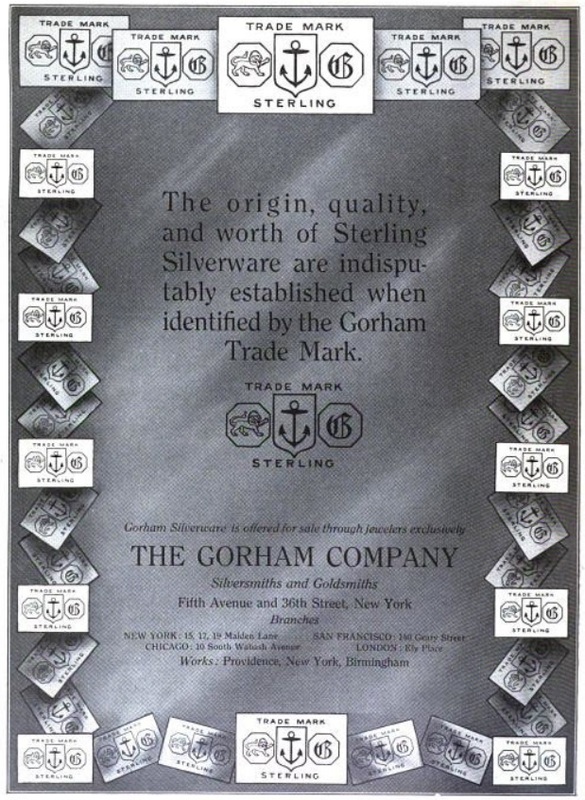 Albany, April 20 - The Silversmiths Company of New York, which Is said to be a merger of the Silversmiths Company and the Silverware Stocks Company, filed Its certificate of consolidation with the Secretary of State to-day. The capital is $14,000,000. The company will manufacture jewelry and silverware. 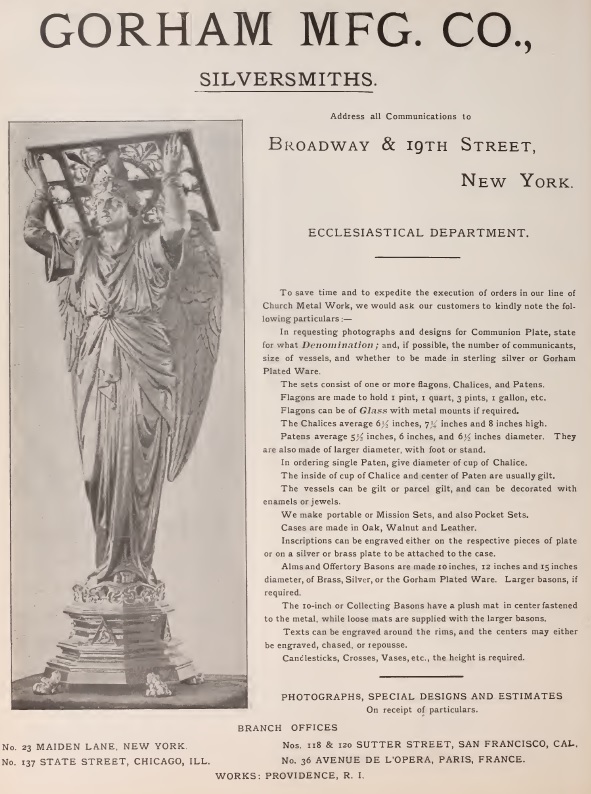 The directors Include Edward Holbrook, John S. Holbrook, New York, and Herbert J. Mills, of Providence. Rudolph Gage, for 41 years in the employ of the Gorham Manufacturing company as an expert silversmith of the old school when it was necessary to do the present day machine done work by hammer, died at the Rhode Island Hospital last Saturday from a complication of diseases, at the age of 73. Born in Berlin, Germany in 1841, he emigrated to this country at an early age, after having learned the silversmiths trade from serving an apprenticeship under his father in the Fatherland. 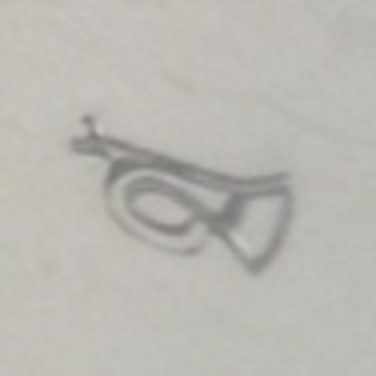 He was sent to this city by the Gorham Manufacturing company, and was for 41 years connected with the concern as one of the most expert silversmiths. Prominent in many organizations, one of his chief interests was in the order of the Odd Fellows, he having been at one time Past Noble Grand of Unity Lodge, and Past Chief Patriarch of Mazeppa Encampment. He conversed fluently in four different languages, English, German, French and Latin, and was in constant demand as an interpreter. He had for some time devoted his energies to gardening and flower raising on a farm which he purchased in Foster. He leaves a widow, Catherine Marx and two sons, Charles R. and Frank A.